Over the course of the week, for World Craft Week, I have been exploring the various crafts I have done over the years, from cross stitch to sewing to crochet, and today we get on to my favourite: knitting. I have been knitting for a very long time! I clearly remember knitting during my break times when I was 7, with my best friend at the time who had learnt to knit around the same time. But knitting did not click immediately with me. My mum (who is an excellent knitter) first tried teaching me to knit when I was about 5, and, while I was interested, I did not get the hang of it at all. My attempts did result in a small (think tiny, like child's purse size) stripy bag made up of all sorts of oddments, which I loved, but I didn't enjoy the knitting enough to continue with it. When I was 7 a babysitter (an old lady who lived round the corner from us; she was probably only in her fifties, but she seemed old when I was 7) offered to teach me, and sat me on her knee, using her hands to control my arms and direct my fingers. This time it clicked, but my technique was far from perfect. I clearly remember the babysitter casting on 15 sts for me in pale turquoise yarn, and within 50 rows of garter stitch all my odd yarnovers had resulted in well over 100 stitches! But I enjoyed it! With the confidence of a small child, my knitting knew no bounds. My first 'proper' knitted piece was a Baby Sunshine doll from the Jean Greenhowe scarecrow collection. The doll had many loose stitches, and the whole thing was knitted very loosely, but I loved her, and the sense of achievement in finishing her. With time and practise my knitting improved vastly, and by the time I was 11 or 12 I was knitting intarsia jumpers for my little sister (there's a photo of her wearing a Little Miss Giggles one at my parents house). I knitted theraputically, and whenever I was ill it would give my hands something to do; I worked my way through books of Jean Greenhow patterns. Unfortunately all these early items are now long gone, but they live on in my memories of them. I have knitted on and off ever since I learnt, and started to get really serious about knitting when I was pregnant with my son, and a lot of my friends were pregnant with their first children as well. I knitted several beautiful shawls as newborn gifts, my favourite being this one in red DK acrylic. No, this is not what I would choose to use now, but I loved the process of knitting it, and the final blanket was beautiful. With every item I knitted I learnt something new, and would happily improvise when something wasn't to my taste. 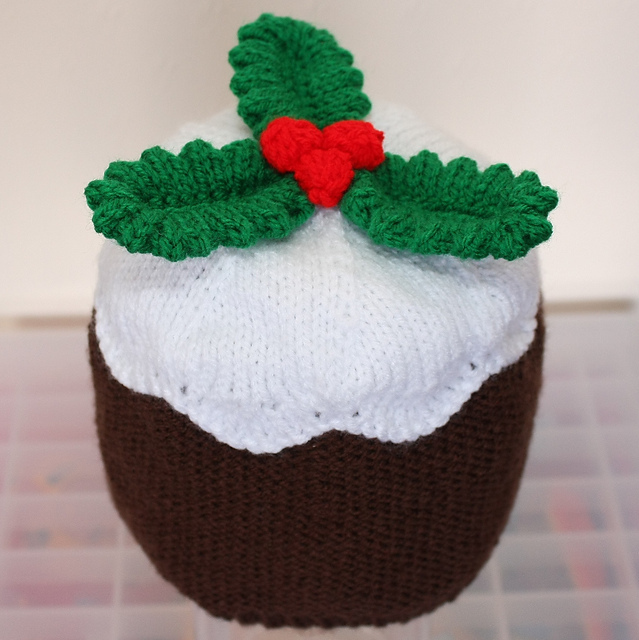 When my son was 18 months old I wanted to knit him a Christmas pudding hat and couldn't find a pattern with 3D sauce, so made up my own and decided to make a leap into the unknown and publish it. That was, as you know, the first of many. How did you get into knitting? What's the knitted item you're most proud of? Definitely most proud of that 3.5kg tiger! not sure anything is going to beat that for quite some time! I would be quite proud of that too. I just need someone else to want one enough to house it for me - I'm still working on getting away with one animal head! I love this story - I learned to knit around the same age with Jean Greenhowe patterns too! I think they must have been the thing to knit in the 90s, my mum had piles of them. They were everywhere when I was small. But so much sewing up! I started a giant version of a dinosaur before my son was born. I think it still required limbs last time I saw it!